Second Day in Fancy Gap – Let's Go RVing! Woke up this morning to pouring down rain so have been trying to decide how to alter our plans. This is such a lovely campground and I had planned to spend the morning walking around but it’s too wet. As I sit here typing I’m looking out of the window enjoying the natural scenery with different birds just hoping from tree limb to tree limb. It is so quiet, peaceful and refreshing, like a dip in a nice pool! Yesterday I realized that the USB ports and the GPS plug on the rig dashboard were not working so this morning I tried to do a bit of research on why. I posted on our FB Newmar group and someone suggested it might be an inline fuse and although I agreed that it might be a fuse I surely didn’t know anything else. This morning I e-mailed support at Newmar about our problem and was hoping for an e-mail response today. Instead within 30 minutes I got a phone call from a tech who explained where to look for the problem. With a flashlight I got down on the floor in front of the driver’s seat – yes, it was close – located the fuse box (who knew), found the fuse, removed it and gave it to Jerry who determined that it was indeed blown. A trip to an automotive store just got added to the plans. Hope there’s one near here! What great service from Newmar! By this time the rain had stopped, so we went for our usual morning walk. We are definitely flatlanders not used to climbing these hills! We stopped by the office to get some ideas for touring and Jerry checked to see if they had a 20 amp fuse – they didn’t. We continued our walk but it was a short one, just over 20 minutes. We left not sure where we were going but decided to take the Blue Ridge Parkway. We actually thought we were headed to Mabry Mill but I think we were to take a left out of the campground and not a right. We eventually ended up at the Blue Ridge Music Center which was first on our agenda anyway. What a neat place. The museum is very interesting and comprehensive. Bluegrass music is performed daily in the breezeway. Today it was Bobby Patterson and Willard Gayheart. They have several CD’s for sale and some outstanding pencil art as well. We thoroughly enjoyed listening to them play a set. Afterward we left and ended up in Galax where we bought gas, a fuse and had a picnic lunch at Felt’s Park. Set Gypsy to bring us back to the campground only to discover that we were only 14 miles away. The drive back was a lot faster but not nearly as pretty plus we didn’t have that “I don’t know where we are going” feeling! After we got back I got back down on the floor in front of the driver’s seat beneath the steering wheel – Imagine! Since it was so very difficult to see even with the aid of a flashlight I blindly inserted the fuse only to discover that the USB port and the GPS plug still didn’t work. Jerry firmly believed that the fuse was blown so he got down there and realized that I had inserted the fuse in the wrong place. I told him exactly where to put it but I had been unable to reach it and didn’t realize it. Now everything is working! We hung around the rig for a while and then headed out to Floyd, VA for the shapenote singing. Floyd is a very small town and upon arriving Jerry just looked at me with that “what have you gotten us into now” look. Our first stop was Floyd’s Country Store. We wandered around a bit and Jerry bought a hat with “Made in 1948” on it and took his first selfie! He sent it to the kids and they couldn’t believe he’d taken the picture himself. We continued to walk around the town, in and out of stores. It’s a bit hippie with a lot of tie dye! We went in a hardware store that probably had anything anyone would need. Though the store wasn’t very large it certainly had a lot of varied merchandise. We finally made it back to Floyd Country Store where we had dinner. I had a spinach salad and a slice of quiche and Jerry had a grilled cheese with bacon sandwich and tomato soup. It all was quite good especially being in a country store. Around 5:30 people began arriving for the shapenote singing. Shapenote singing is absolutely fascinating. 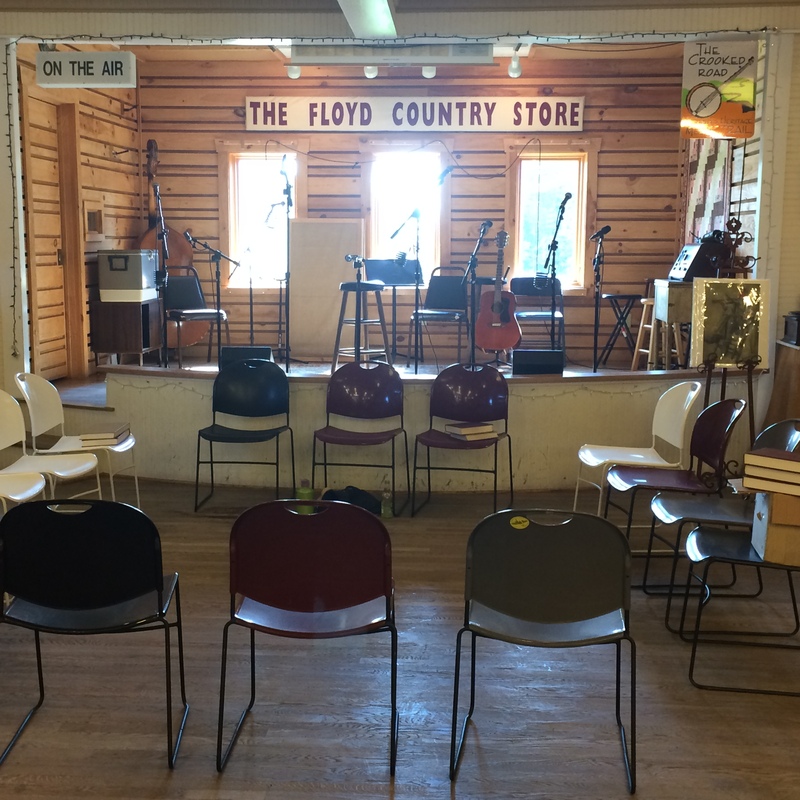 Quoting from the Floyd Country Store webpage “Shapenote is a unique singing tradition, dating back to early America. Singers sit in four voice parts facing each other, forming a “hollow square.” Unaccompanied, they sing hymns and anthems in a style that is often loud and raw. It is a participatory practice, not framed as performance. The term “shape note” comes from the notation; the notes are written with different shapes- triangle, square, diamond as well as circle.” Singers use the syllables fa, la, sol, ti. It was quite interesting but I didn’t feel that I could participate as it was way out of my comfort zone. Jerry kept urging me to try it and I kept coming up with excuses but after he called me “chicken” several times I jumped up and joined the group. I definitely have not been musically challenged like that in a long time! We sang for over two hours and though I’m quite sure I was la, la-ing when I should have been fa, fa-ing, no one complained, criticized or judged. It was a very eclectic and friendly group and the leader was quite good – and patient! After two hours a very tired Gale headed back to the campground for a good night’s sleep!